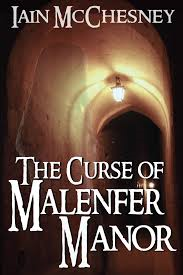 The Curse of Malenfer Manor by Iain McChesney, is a 2013 release and is published by Wayzgoose publishing. I received a copy of this book from the publisher in exchange for an honest review. Irish mercenary, Dermont Ward, watches his best friend Arthur Malenfer, die during World War one. Consumed by guilt for not being able to do more, Dermont has taken to drink and hasn't been able to settle. When he sees Arthur again he thinks he's gone mad. But, Arthur's ghost is there and he needs Ward's help. Ward is to return to Malenfer Manor, Arthur's home, and meet with his surviving family and issue proof that Arthur was the father to twin boys that grew up at the Manor. Arthur's father had discreetly taken care of the situation when the boys were born and their mother died in childbirth. With the only male heir having recently died of the Spanish flu, Arthur's boys could inherit. If not, the bulk of the inheritance would go to the lovely Simonne, the odd young woman that is Arthur's niece. If that weren't sticky enough there appears to be a curse on the Malenfer family, especially the males in the family. If it is revealed that the twins are in fact Arthur's, they could become another victim to the curse. Ward, finds himself in the middle of a family grieving the loss of a family member, reeling from Ward's bombshell announcement, and the domino effect that causes. He also becomes attached to Simmonne. This beautiful young lady seems to have the ability to sense things and see things that border on the paranormal. She enlightens Ward on the subject of the infamous family curse, some who believe in and others that do not. All I can say about his book is right now, as I have just finished it, is Wow! This is my kind of book !!!! Finally, an author that can right Gothic mystery like it should be written. All the rules of Gothic mystery were adhered to. There is the old manor house, dark family secrets and relationships, a young women in danger, and a ghost story, plus a murder mystery and romance!!! Terrific writing! This author knows how to weave a tale, let me tell you. Historically, the book is well researched, the dialogue fits the period of 1900's France. The atmosphere is palpable, tense, suspenseful, and at times heavy with gloom. There is a sadness that dwells in this manor and we can feel it. Ward is able to see the situation from a neutral standpoint, well, to a degree. His love for Simonne, and his guilt over Arthur's death has him beating himself up, but as far as the mystery goes, Ward is able to where the real danger is and prevents further injustices. Could this be the end of the Malenfer curse? Could over a hundred years of back luck finally be over for this family? Well, you will just have to read this book to find out. I for one was completely engaged, finding it hard to stop reading it. This book will appeal to mystery lovers, paranormal fans, horror fans, and historical fiction fans. For those like me, that have a passion for Gothic mysteries, this is a true masterpiece. I Loved, Loved, Loved it!!! Please write more like these Iain! I found you on Book Blogs and sent you a friend request. Cool site. I'm your newest follower. You can find me at http://adriennereiter.blogspot.com. Good connecting. What a great cast of characters. I enjoyed the review. I'll have to check 'The Curst Of Malenfer Manor' out. Love the title too. Yes, this is good book to read for Halloween. Hopefully, soon I will have a giveaway and author spotlight/interview for this book.